I want to start this column with a sincere THANK YOU to everyone who helped in any way with Lecturers Conference – this includes those who sent ideas, loaned me props, transported items for me and to all who donated to my gift. To the 28 Connecticut Grangers who traveled between 300 and 400 miles each way, thank you for attending and thank you for being a part of our Connecticut program. The Color Orange isn’t the easiest topic to work with, but you did us proud. Thank you again. Next year, our conference will be a lot closer – in Rhode Island. The exact location hasn’t been chosen yet but most likely it will actually be in Rhode Island and not at Nichols College. I will let everyone know the details as soon as I get them. The State Lecturers will be meeting again at Leaders Conference. The Theme next year will be “Let’s Celebrate” and Connecticut will be celebrating Halloween. It’s not too early to start looking for costumes, skits and other ideas. The sooner I know what I have to work with, the sooner I can try and write a program. I know I can count on all of you. I hope everyone will be attending State Session later this month. Thursday night we will be honoring our Lecturers. Your Lecturer can make or break your Grange. Let’s show them how much we appreciate them. In addition to the awards we will be presenting some of the numbers from Lecturers Conference. I wish we could present the whole program, but there just isn’t enough time. 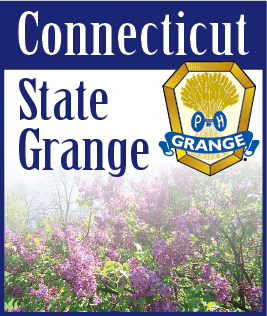 Now that better (cooler) weather has arrived why not plan on getting out at least once a week to some Grange activity. Visit a struggling Grange. You will not only help them fill the chairs, but you can make some lasting friendships. Grangers are the best. Get out and meet them.